The laser has been regarded as the potential illumination source for the next generation of projectors. However, currently the major issues in applying the laser as an illumination source for projectors are beam shaping and laser speckle. We present a compact solution for both issues by using a vibrating diffractive optical element (DOE). The DOE is designed and fabricated, and it successfully transforms the circular Gaussian laser beam to a low speckle contrast uniform rectangular pattern. Under a vibration frequency of 150 Hz and amplitude of 200 μm, the speckle contrast value is reduced from 67.67% to 13.78%, and the ANSI uniformity is improved from 24.36% to 85.54%. The experimental results demonstrate the feasibility and potential of the proposed scheme, and the proposed method is a feasible approach to the miniaturization of laser projection display illumination systems. K. V. Chellappan, E. Erden, and H. Urey, “Laser-based displays: A review,” Appl. Opt. 49, 79-98 (2010). C. M. Chang and H. P. D. Shieh, “Design of illumination and projection optics for projectors with single digital micromirror devices,” Appl. Opt. 39, 3202-3208 (2000). P. C. Chen, C. C. Chen, P. H. Yao, and C. H. Chen, “Double side lenslet array for illumination optics of laser projector,” Proc. SPIE 7232, 72320X-9 (2009). G. Zheng, B. Wang, T. Fang, H. Cheng, Y. Qi, Y. W. Wang, B. X. Yan, Y. Bi, Y. Wang, S. W. Chu, T. J. Wu, J. K. Xu, H. T. Min, S. P. Yan, C. W. Ye, and Z. D. Jia, “Laser digital cinema projector,” J. Display Technol. 4, 314-318 (2008). S. Zhang, “A simple bi-convex refractive laser beam shaper,” J. Opt. A, Pure Appl. Opt. 9, 945-950 (2007). R. W. Gerchberg and W. O. Saxton, “A practical algorithm for the determination of phase from image and diffraction plane pictures,” Optik. 35, 237 (1972). J. R. Fienup, “Iterative method applied to image reconstruction and to computer-generated holograms,” Opt. Eng. 19, 193297 (1980). S. Kirkpatrick, C. D. Galatt, and M. P. Vecchi, “Optimization by simulated annealing,” Science 220, 671-680 (1983). L. I. Voicu, W. A. Rabadi, and H. R. Myler, “Object support reconstruction from the support of its autocorrelation using multiresolution genetic algorithms,” Opt. Eng. 36, 2820-2827 (1997). B. Redding, M. A. Choma, and H. Cao, “Speckle-free laser imaging using random laser illumination,” Nature Photon. 6, 355-359 (2012). M. Nixon, B. Redding, A. A. Friesem, H. Cao, and N. Davidson, “Efficient method for controlling the spatial coherence of a laser,” Opt. Lett. 38, 3858-3861 (2013). Z. Cui, A. Wang, Z. Wang, S. Wang, C. Gu, H. Ming, and C. Xu, “Speckle Suppression by Controlling the Coherence in Laser Based Projection Systems,” J. Display Technol. 11, 330-335 (2015). N. E. Yu, J. W. Choi, H. Kang, D.-K. Ko, S.-H. Fu, J.-W. Liou, A. H. Kung, H. J. Choi, B. J. Kim, M. Cha, and L.-H. Peng, “Speckle noise reduction on a laser projection display via a broadband green light source,” Opt. Express 22, 3547-3556 (2014). E. G. Rawson, A. B. Nafarrate, R. E. Norton, and J. W. Goodman, “Speckle-free rear-projection screen using two close screens in slow relative motion,” J. Opt. Soc. Am. 66, 1290-1294 (1976). L. L. Wang, T. Tschudi, M. Boeddinghaus, A. Elbert, T. Halldorsson, and P. Petursson, “Speckle reduction in laser projections with ultrasonic waves,” Opt. Eng. 39, 1659-1664 (2000). B. Redding, G. Allen, E. R. Dufresne, and H. Cao, “Low-loss high-speed speckle reduction using a colloidal dispersion,” Appl. Opt. 52, 1168-1172 (2013). L. Wang, T. Tschudi, T. Halldorsson, and P. R. Petursson, “Speckle reduction in laser projection systems by diffractive optical elements,” Appl. Opt. 37, 1770-1775 (1998). A. Lapchuk, A. Kryuchyn, V. Petrov, V. Yurlov, and V. Klymenko, “Full speckle suppression in laser projectors using two Barker code-type optical diffractive elements,” J. Opt. Soc. Am. A 30, 22-31 (2013). 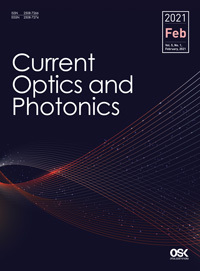 W. D. Qu, H. R. Gu, Q. F. Tan, and G. F. Jin, “Precise design of two-dimensional diffractive optical elements for beam shaping,” Appl. Opt. 21, 6521-6525 (2015). J. W. Goodman, Speckle Phenomena in Optics: Theory and Applications (Roberts & Company, Colorado, USA, 2007). American National Standards Institute, “American National Standard for audiovisual systems-electronic projection fixed resolution projectors,” U.S. Standard, IT7.228-1997 (1997).